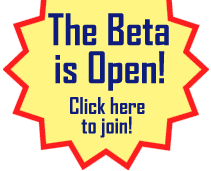 « The Early-Access Beta is Open! I just realized that since I finally opened the beta, I can now post the release notes for the new builds here publicly without getting a torrent of “Send me an invite!” blog and facebook comments and tweets! Yay, I am so happy to be out of the invites business! I’ll do a post with numbers from the open beta launch sometime next week, but it’s going great, and I’m super happy and relieved. I was really worried about the community, and all the new players are blending into the community really well, and it all feels very healthy. Phew! This build was almost exclusively bugs and minor features for supporting lobby rooms with lots of people in them. Most of these were discovered as the result of the human load test we did right before opening the beta. The main problem was that with lots of people in the lobby, you couldn’t really mouse-over somebody to reliably invite them into a game, so I struggled with how to solve this until somebody in the lobby said, “hey, there’s a problem because the player under my mouse keeps changing”, which pointed me to a reasonable and obvious solution: keep the player under your mouse fixed, even if they’re moving around in the sort order (due to other players joining or leaving, or due to them changing state). This is slightly weird, because it means you can get into a state where the lobby has scrolled such that there’s a blank space above or below, but it works pretty well. Edge behavior for fixed-point mouse selection. k3 enabled on veranda…k3 hard tells anyone? Those are just the raw notes I post in the private beta forums,2 so they might not mean much if you’re not a player. The way to solve that problem is obviously to become a player! Up next, a couple super-minor fixes to this build, and then a brand new mission! I haven’t added a mission in a long time, so this will really change things. I’ll talk more about that in another post, but I’m hoping to have it stood up this week. I’m loving the slightly meta screenshot. It’s really cool seeing all these things that can happen now that the beta is open, I hope they lead to even more people joining up. Hi, yeah, it’ll eventually be on steam, don’t worry. I just want to grow the community slowly right now.